Building a cityscape for the hex pinboard project. 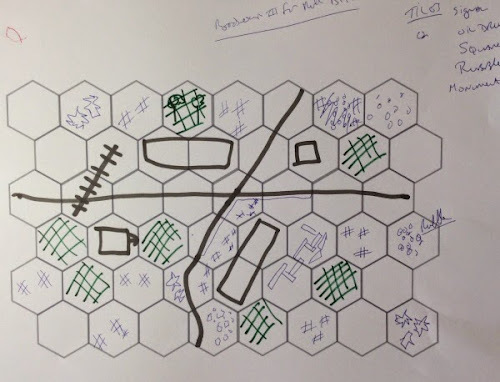 To date, my WWII pinboard games have been played out on the grass flocked Kallistra hex boards and when representing a small town or village, a couple of blank grey template hexes have been placed to cover the grass and then buildings added. 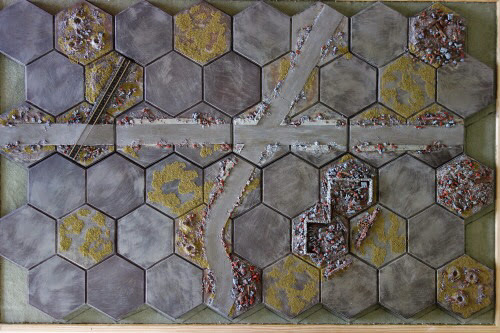 But when it comes to doing scenarios for city fights on a board filled with brick or concrete structures, I fancied having a more city orientated hexed gaming board. Time then to make a dedicated hexed city set-up. 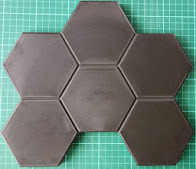 This is not a particularly big project because we are just using eight of the Kallistra 6 hex cluster tiles and since these stack when not in use, storage is minimal, fitting into a box that is just 12" x 10" by 6" deep. This post goes through the process of creating a cityscape from the planning and materials needed, right through to pictures of the final layout. Please press the 'read more' tab for the rest of the post. Kallistra Tiles - I ordered 8 of these blank boards at £2.85 each. 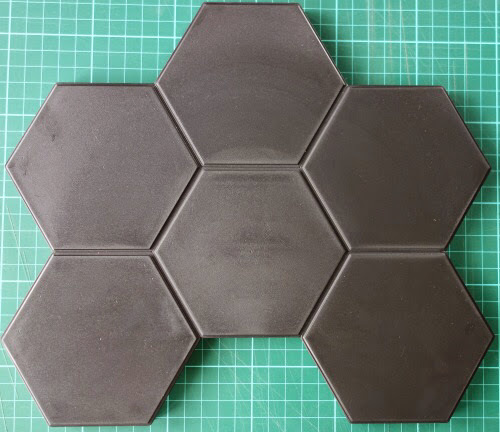 They are formed in hard plastic, offer 4" hexes and are both stackable and hollow, so that some textures can be added to the surface and they can still stack away for storage. 8 boards will fit within the 3' x 2' (pinboard) gaming space to give an 8 x 6 hex grid. 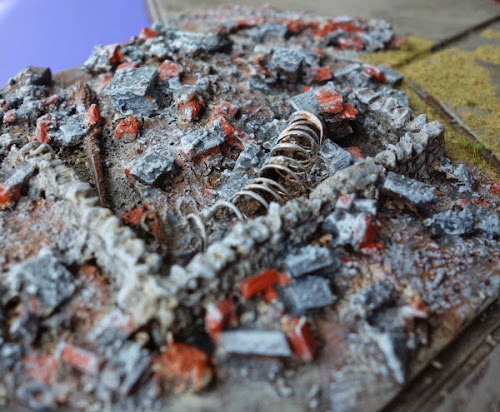 The balance between modular and free standing terrain - There are plenty of inspirational examples of ruined city scenes at wargame shows, in magazines and on the web, showing wonderfully sculpted landscapes with buildings fixed direclty to boards and rubble applied to meld everything into a single unified scenic. 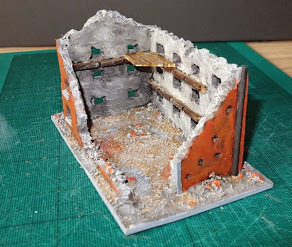 But the primary focus of this blog is on wargaming in a small space and so for this project to work for me, any features sculpted onto the boards need to be very shallow so that the boards can still stack for storing. This means that structures such as buildings need to be added just prior to play rather than being actually fixed to the game boards, requiring some open spaces to be left on the boards to receive them. After some thought, it became clear that in fact quite a lot of the hex tiles actually need to remain open and be without texture if buildings, parks, rail line and scenic templates (such as the signal box to the left) are to be added during set up, while also offering some variation in how the boards can be re-configured. So rather than making a set of boards that are brim full of rubbled terrain etc, as I initially envisaged, the boards will be relatively open, but by the time they are dressed with 'plonk down' terrain, they should look quite good and importantly be versatile and easy to store. The stack of 8 tiles can be stored in a box measuring just 12" x 10" x 6" deep, easy to tuck away on a shelf. Most of the add on terrain can fit into two box files. 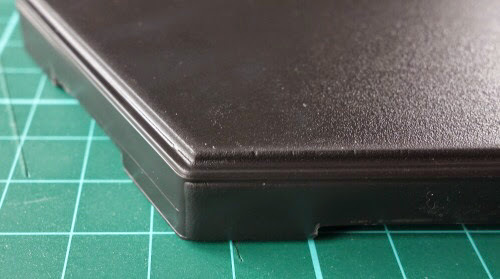 Relief on the boards can be up to around 6mm deep and still be able to stack (due to the hollow nature of the boards). 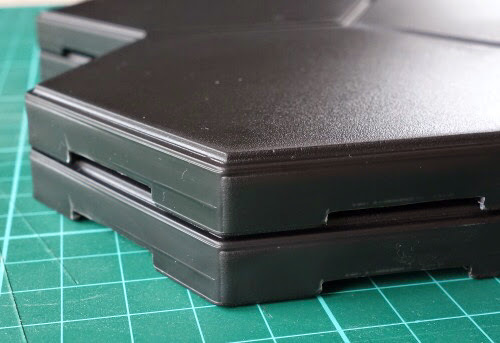 The board that sits on the top of the stack can of course have any terrain of any height that the user wants permanently fixed to it since another tile will not be stacked upon it. 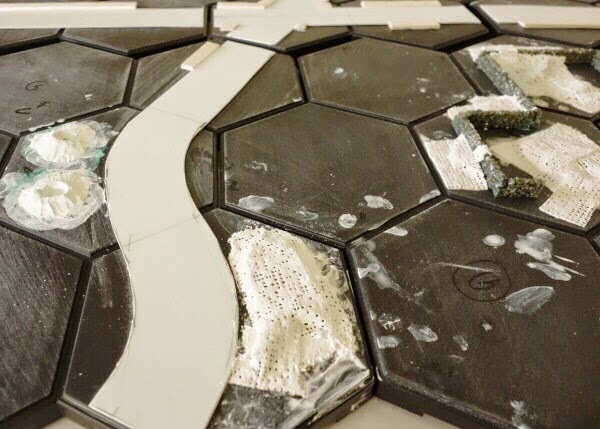 The tiles can stack because the outer edge of the board (photo above right) sits on the recessed edge of the board underneath it (see photo left), so when working on each tile, this outer recess must be fully preserved and none of our sculpting can encroach onto it. On the inner hex lines, the 'gullies' between the hexes can get some modelling paste or flocks / gravels in them, as long as the hex pattern is not substantially obliterated - we still need to see the hexfield. But, if you plan to place down any of the Kallistra accessories on these boards such as their roads or pulverised ground, then these gullies should be left clear so that the accessory can sit in them (photo above left - note the recess on the tile edge that the tile above it will sit on when stored). While browsing at Stalingrad photographs, I was surprised just how much open space there was in some parts of the city and so edge to edge rubble on our board was not the way to go anyway. Right - This photograph shows how the boards stack. Our 8 tiles will stack to a depth of just over five inches. 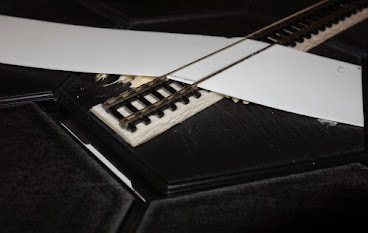 I spent a long afternoon with the boards and various shapes of paper trying to lay down a road net and rail line that could be re-configured by having the boards shuffle around and create new set-ups. On an 8 x 6 grid it is harder than first imagined. In the end, as always, the simple solution made the most sense - reduce the road net to two straight roads anchored on a crossroads feature and then just lay down one length of rail track (2 hexes long) in conjunction with the road, so that we get a rail / road crossing and then we can just add 'plonk down' lengths of track during set up as (and if) required. 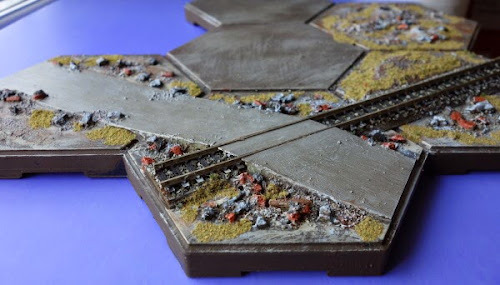 This does of course require that some hexes are kept free of texture so that the rails can be placed and enough are kept free that tiles can be swapped around while still allowing a rail line to travel directly from one side of the table to the other. 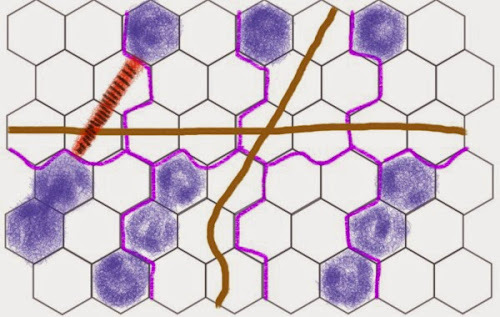 This sketch shows the two roads (brown), the rail section (stripey red), the hexes that need to be kept empty to maximise configuration for extension track to be placed when the boards are swapped around (filled purple hexes) and the outlines of the 8 hex boards themselves. Note how the road crosses the track. 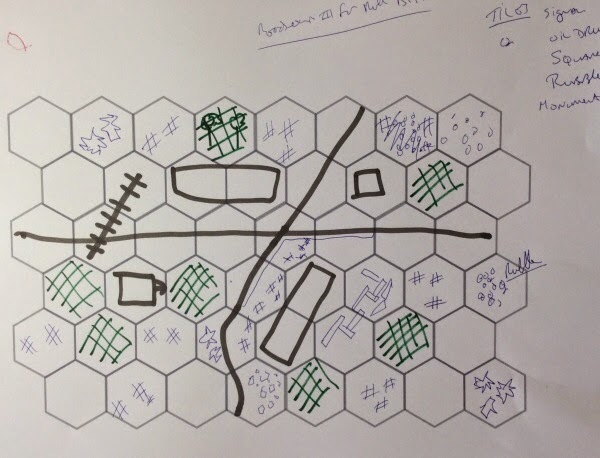 The planned empty hexes when not in use by rail track can of course be used for other things, including parkland, so some of those hexes could be spot flocked in green as that won't make any difference to rail track placement and could even enhance it. 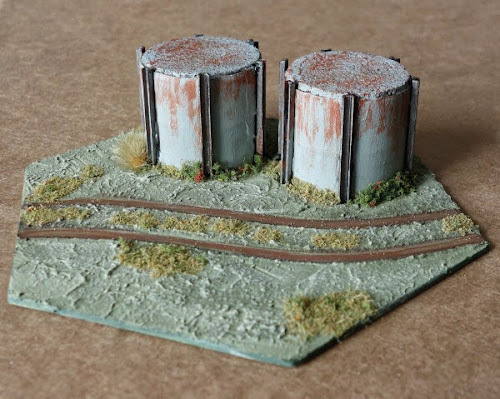 I made a list of the various terrain types that the board should be able to accomodate to make a typical city scene, which included low walls, oil storage tanks and a parade square - perhaps with shell craters. This is a section of my 'plonk down' rail track. It is 'N' gauge track, glued to a balsa wood base and dressed with fine stone chippings and some bits of flock. 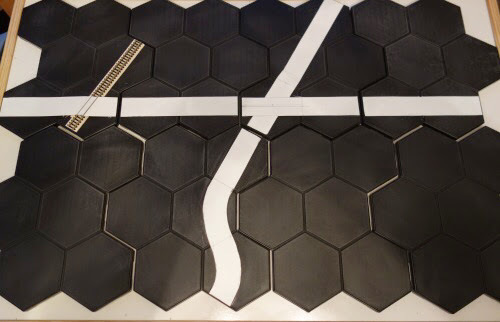 They are mostly 2 hexes long, with one being made for a single hex in case I want to insert a scenic piece such as the signal station. I also have an end of rail piece (a block with buffers on it), so that the track can be terminated at any point on the board and still look reasonable. The basic shopping list to get all of this done runs something like this. 8 Kallistra blank hexes, 2 sheets of plasticard for roads (with hindsight light card might have been an easier material to work with). 2 x 30" lengths of 'N' gauge rail track (the free standing pieces can be used in other non-city games as well), fine gravel, large gravel, some Raw Umber, Venetian Red, Buff Titanium and Sap Green acrylic paint (Daler and Rownney Graduate range in tubes from art shops seem ideal), some cheap craft acrylic black paint which can be mixed with the buff titanium to make up differing shades of grey. The thin cheap fun foam that craft shops sell for kids can be hand cut into thin strips and then cut down into small brick like shapes. Just half a sheet will make loads of bricks and this can supplemented with concrete slabs made from foam core and brick like pieces of balsa wood and bigger pieces of balsa to look like torn up flooring or doors etc. All this can go into an old yoghurt tub to form the basis of a rubble mix. 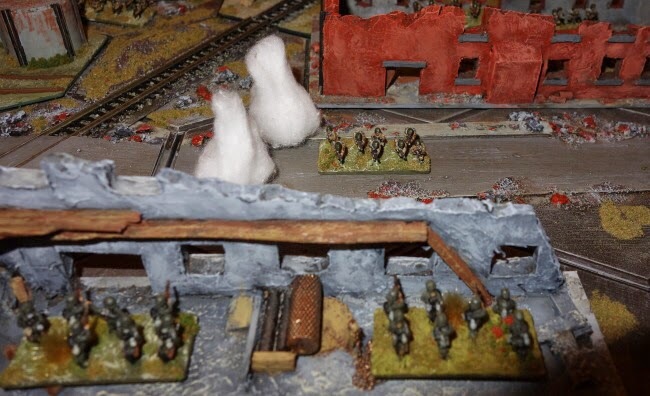 The fabric impregnated with plaster (no idea what it is called, but art places sell it) makes for a fast way to get rubble type mounds onto the board. The resulting feature can then be dressed with PVA glue and the rubble mix or gravel and sand. A cheaper way would be to use small shapes of the fun foam glued to the tile, which is then covered with a piece of paper towel that has been coated with thin PVA glue. A good creamy filler paste will be needed. I use 4Grounds basing paste but something like Tetrion will do just as well. 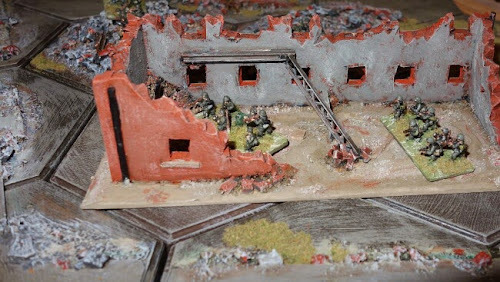 There are plenty of useful things that can be picked up in the shops and transformed into terrain bits. The floor protectors (£1) and jazzy cycle tyre valve covers (£1.50) shown to the right were bought from Wilko's (UK) and these will become oil storage tanks (see below) and a silo / machinery part placed in a ruined building. 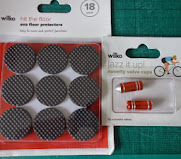 The oil tanks are simply made from six protectors stacked on top of each other, with a thin cork protector (also from Wilko's) placed on top. A wrap of paper has gone around each tank to hide the disks. As buildings will be the main 'stock' of the city boards, a cheap and fast way to get the sort of numbers needed is to use foam board (from most art shops). A few matchsticks for window sills and a bit of rubble around the place and you get quite a serviceable building or part of a building. The building below has been constructed with foam core walls and some balsa wood has been used to suggest smashed flooring. The rubble dust inside and outside is just made from a sand / gravel mix. The gutter downpipes are cut down cocktail sticks and their main function is to hide the joints of the foam core walls. It is a bit rough and ready, but has its own charm. A quick visit to a model rail shop can get various flocks and gravels plus some plastic bits that can be used for pipes, girders and gantries, just the sort of thing that helps elevate the model to the next level. Anyway - on with the job. Preparation. The 8 hex bases were washed in warm soapy water and given a light rub down with sandpaper (I don't even know that this is necessary, but it was done anyway). Underneath each board, a small label was attached, so the boards could be numbered 1 - 8 to help with future scenario generation. It is helpful if paper road sections are cut out and added to the boards with poster putty to ensure that the road plan is adhered to - I glued my first section of road to the wrong hexes! First features - The road net went down using thin plasticard (lightly sanded on both sides), cut to 35mm wide and using as few joints as possible. Care has to be taken here to measure exactly, so that the road surface does not protrude over the recess on the tile edge, otherwise tile stacking will be compromised. When the roads are painted, the colour can be dragged down the tile edge to reduce the broken look between road sections. When doing the tile that is going to have the section of rail track (top left quadrant in the photo on the left), it is best to add the track before doing the road so that the road can be modelled to go over the tracks. The track needed to go onto a balsa wood base so that it could properly mate up with my extension tracks as they are already based that way. The road was elevated slightly as it crossed the rail track, so that the rails were embedded beneath the road surface (just cut the road into three sections so that the tracks show through like tram tracks) - see below. I checked that a tile could still be stacked over the feature and this is a good habit to get into when adding various features. Filler paste - To take the whiteness out of the paste, a touch of sap green acrylic paint is added plus just one drop of black paint to a dollop of paste. This makes up a sort of dark olive green colour. To add a bit of texture a pinch of my least favourite vile green coarse flock goes into the mix. 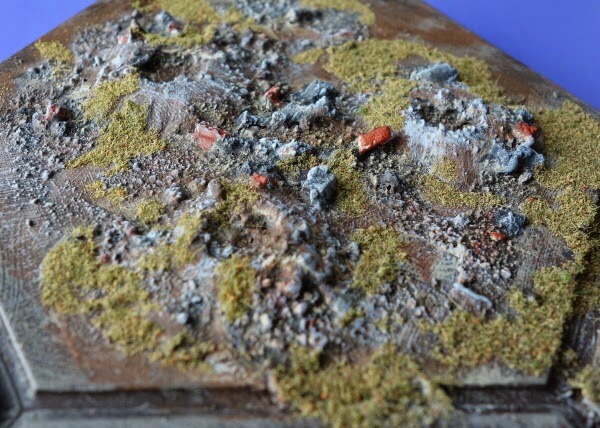 This is the basic mix that was used on the base of the scenic signal box shown above (and my figure bases). Nearly everything I do gets a 'mucky wash' at the end and this generally makes the dried filler a tone or two darker. A hot glue gun got the road fixed into place (don't let the hot nozzle touch the plastic card ..... I did! ), with a few matchsticks under the raised road to help support it. The filler paste was then applied to block in the sides of the raised road to give an earthy bank effect. First Paint - A small job but things need to be done in a certain order. The balsa wood base under the track got a paint job to make it match my existing rail bases. A detail brush was used to avoid the sleepers. Between the sleepers was left unpainted as these would be filled with fine stone later. STOP! - It was time to set up various terrain bits on the board and get an idea how the full board needed to look and decide which hexes must be left open to give enough spaces for buidings, marking those hexes (on the boards themselves) that can be filled with rubble, craters or flocks for parks. Big two hex buildings can have a large footprint that spills over slightly into adjacent hexes and this needs to be noted - so that we give them room to 'breathe'. Craters and kerbsides can be considered. I made a reference map (below) just to help me note which areas had to be open and which (including just hex edges) could stand a little texture. Making this map was to become essential as any markings I had made on the boards were soon obliterated. The hexes around the crossroads will likely be taking the bigger 2 hex buildings. Note the crossroads (in hex C5) has some small hatch markings, as does D4 and E4, this was to remind me not to put rubble on that side of the road because the large building might need to overflow into that space (I did in fact go rubble mad and put some there anyway!). Hex A2 has craters, as does part of hex E4 and F8. Hexes D6 and E6 have the low stone walls and this section became my top tile when stacking for storage purposes. 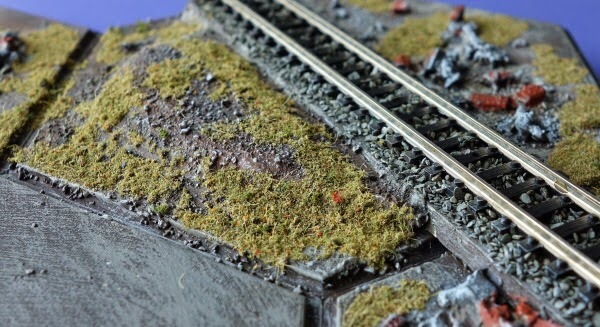 The large green hatchings show partially flocked areas so they can be used for parkland, rail track or be totally covered with a scenic hex template. Low features - This was the first chance to lay very low features that would not interfere with the stacking of tiles. I put some kerbsides down near the cross roads, with gaps that would get covered by rubble spillage. Very low walls (6mm or less), showing the remnants of buildings can go in, but my walls are little too high for the tiles to stack, so my D6 tile became my top tile when storing and knowing this allowed some decent rubble stacks to be built. The craters were added directly to the board using Milliput, a bit messy, but a good result. Once some gloopy rubble mix goes down and some sand texture gets added, they look more natural. A large mound, the same height as the track, went in to one side of the track (in the track hex B2). This just adds visual appeal to what otherwise would be a dead space. For the rubble areas, glued down shapes of fun foam (kept to a single layer) were covered with the plaster dipped fabric (paper towel dipped in PVA could have been used instead). This gave low undulations that were later developed with either sand, filler paste, fine gravel or the rubble mix - usually all four. Right - This is a busy part of the board. You can see the couple of craters added to E4 and just to the right of the road in F4 a small mound has been developed ready to be dressed with rubble. At the very top of the picture, the broken line of kerbstones can be seen and to the right, you can make out the grey walls in D6 and E6, which have small mounds on both sides of the wall (and draping over them) ready for dressing later with rubble and sand. This all matches the sketch shown above. The Rubble mix - A couple of spoonfuls of the pre cut bricks, timbers, stones, bits of pipe (cut down cocktail sticks) were put into an old ready meal dish (or yoghurt tub), together with some PVA glue and a small squirt of the raw umber (a sort of brown) acrylic paint and mixed well. The area to receive the rubble was selected and given a quick coating of PVA glue plus a few extra dabs around the feature and then the rubble mix was applied to that spot with a 10mm flat brush and then moved around to spread it out and stay low enough to still allow the tiles to stack. Some course sand went around the base of the rubble and some was also very lightly sprinkled on top of the wet rubble to look like fine debris. All the rubble mounds got this treatment except the walls, which had thicker and higher applications of rubble added (because this will be the top tile) and I drove a few girder shaped plastic bits into the mix for effect. One piece of coiled wire was partly embedded to represent a section of old barbed wire. The edges of the road were lightly rubbled, with some bricks and sand spilling onto the roadway here and there. At this point I diverted attention to add some of this rubble to the foam core buildings so that they would match the board. Hunting down odd spaces - Using the basic filler paste mix (showing green on the hex grid below), I went through every tile, looking for places that could stand a bit of texture. This was mainly to knit separate stacks of rubble together, soften the kerbstone edges on the non-road side of the kerb and to give a texture to two of the hexes designated as 'open' by scraping the paste on and then off, so that the slightest of texture was left behind. The crater hexes had this filler brushed here and there just to help naturalise them. To use the last bit of filler, I went along all the exposed road edges and just made sure that they were given some texture to soften that edge. At the same time a bit of rubble was added here and there. The opportunity was taken to add a low wall in C8 to run with the road and E7 had a heavily rubbled wall added to one side of the hex. This was a hex reserved for flocking and the rail track, but since the track only needs the middle part of the hex, a linear feature to the side can be accommodated. The undercoat - A base coat of acrylic raw umber went down over everything (all the boards) except the railtrack itself, to knit the landscape together with a consistent tone. Here and there, I allowed the brush to pick up a bit of Venetian Red so that there would be a bit of a tie in to the red brickwork that would follow. Particular care was taken at the rubble sites to make sure this paint got into all the nooks and crannies as it acts as a further binder and provides shading later. Once dry, the roads and the craters needed a second coat of raw umber. With everything covered in one colour, the board looked very anonymous. Dry brush - The whole landscape got a decent dry brushing with the buff titanium (a sort of canvas type colour, it is a little more gentle than stark white and adds a creamy warmth) mixed with some grey. Features started to pop out. The open tiles looked a bit too light after the dry brushing, but the mucky wash was always going to sort that out. Detail, detail detail - Time for the smaller detail brush. The bricks and stones were picked out in brick red colour (venetian red dampened down with the buff titanium) with some done instead in grey. 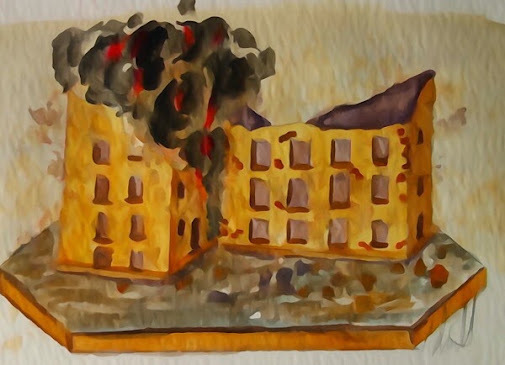 They were all roughly painted, so that plenty of the raw umber still gave deep shading towards the base of the bricks. The craters had some earth colours added. The road was painted a light grey. Complete the rail track - The gaps in between each of the sleepers were filled with PVA glue, as were the sleeper ends outside the track. Fine gravel (from the model shop) was then scattered over the track, tapped down and then the tile tipped over for loose stones to fall away. This was left to properly dry. The mucky wash - My dirty wash (for terrain - not figures) is an old Games Workshop paint pot half filled with water, plus 4 drops of black paint and three drops of strong brown ink (Daler and Rowney acrylic ink). Shaken well, it darkens all colours and adds shading in crevaces. I gave a generous coating, using just over two lots of the mix to go over all of the boards, making sure that the wash went deeply into all the rubble and the stones on the rail track. The road was done last with a new mix so that there was enough wash to give a consistent affect along all the road sections, with the brush strokes only going in one direction, so the road would always match up when boards were swapped around. Highlight - A very pale grey was dry brushed over all the texture. In particular all the grey stones were highlighted and everywhere that had the small grains of sand was lightly brushed. The road was carefully dry brushed in one direction with an even pressure so that every road sections all looked the same when done. Flocking - Broken patches of flock were applied to all the designated areas plus some overspill where appropriate was allowed to break up the hex outlines. The craters got some attention as did some other areas where it just looked right, for example on the mound forming part of a rail track hex (B2). Below, the rail track cluster (or board 1 as label on the reverse side describes). Note the effect of the road going over the rails. There are two clear hexes and these now look the right colour since the mucky wash was added over the dry brushing. The cratered hex is top right. The roads and rail section have some rubble and flock just to add texture to the board to help keep things looking interesting and prevent the board from looking 'too grey'. These are small spaces that would not be used by other terrain features anyway. Below, the rail hex has a large mound to one side that is part grassed. The mound is the same height as the track, so that the tile will stack and is formed from two layers of kids fun foam. The photo doesn't show it that well, but visually it looks good and very natural on the board. Below, one of the crater hexes (this one is on the rail board). Adding the flock just brings another opportunity to take the 'grey' out of the cityscape. Below, one of the pair of heavily rubbled walled hexes. Note the barbed wire and timbers added to the mix. The sandy grit has provided a grain so that dry brushing will give the effect of fine debris covering the rubble. Below, the other walled hex. Note the two iron girders, some pipe and wood panels embedded in the rubble and covered with the dusty fine debris. 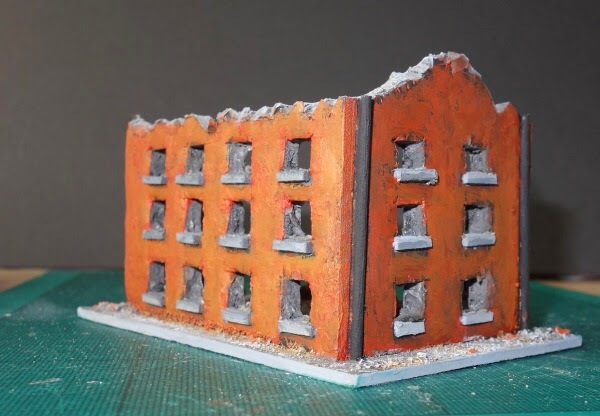 Working on buildings - As stated, a fast stock of buildings can be made cheaply from foam core and few matchsticks etc. This is a building to represent Pavlov's House (see previous post), a one hex structure that been deliberately put onto a large base, so that it spills slightly over into the next hex just to break up the form of the hex lines and to make it a dominant feature. Things can get rather tight in these buildings for placing units, hence one side of the building (below) has been left open and ruinous to assist in easy handling of bases. Some buildings can have machinery type items put in them, or be heavily rubbled internally. Making a few structures that just represent one remaining corner of a building using two triangular shaped pieces of foam core with jagged edges can very quickly bulk out the building schedule. Some of this is just to get me quickly up and running. In the future I will no doubt see some nice resin models that may replace some of the weaker home made items. Scenics - I have a growing collection of these scenes that are directly built onto a single hex template that can just be placed down onto any open hex space. They are visually pleasing and add flexibility to the battlescape configuration. The oil storage tanks seemed an essential element for this board, but anything from graveyards and monuments to a train station or more rubbled hexes can be put to good use and of course used in non-city games as well. RIGHT - The completed bare layout with everything in the same position as shown in the sketched plan. The two hex rail track is embedded and so in some scenarios the player may want to ignore it and treat it as either open or industrial wasteland etc. The flocked hexes are only partially flocked with a patchwork look and they are easily covered if not needed. 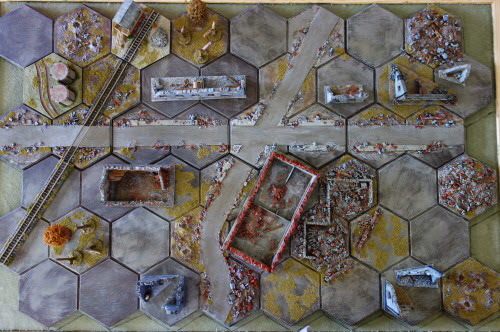 These multi functional hexes do give a lot of set up flexibility but also help prevent the board looking too dreary. The density of the rubbled hexes can be compared to the rubble around parts of the road and railway, which by their obvious lower density are just there as visual dressing rather than counting as 'rubbled hexes'. The rubble that half fills the road hex exiting the bottom part of the map (F4) does count as a rubble hex, the rubbled wall in E7 just counts as a wall, so it is a linear feature rather than a 'fill the hex feature'. 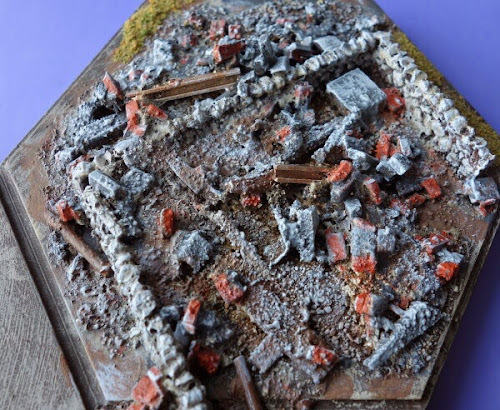 LEFT - The layout dressed with terrain ready for 'The 37th Guards' scenario (see the last post). 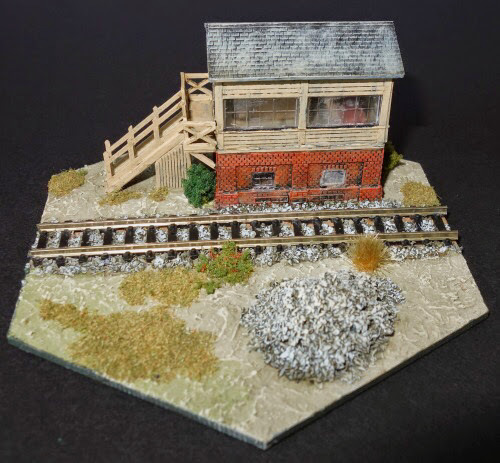 The rail track has had the signal box scenic base added at the top end of the track and one length (2 hexes) of expansion track at the other end. It is there for visual effect only, so in this scenario will count as open and players who do not have track can get away with it - though the signal box hex will still need to contain a building of sorts. You can see that only a couple of the buildings are purposely designed as two hex buildings, so I could do with making another two for their visual impact and making line of sight etc a little more intuitive. The relationship of the rubbled wall hexes (D6 and E6) with the building next to them makes for an interesting location on the map as rubbled hexes in the 'Tigers at Minsk' rules count as being fortified and so something of a defensive 'hub' is created here. It is surprising how many little nuances like this crop up in a small playing area, making it feel like a lot is going on in our small space. RIGHT - The terrain for the Guards scenario viewed from the German side of the table. It uses the boards set out in the same positions that they were in when the boards were being built. 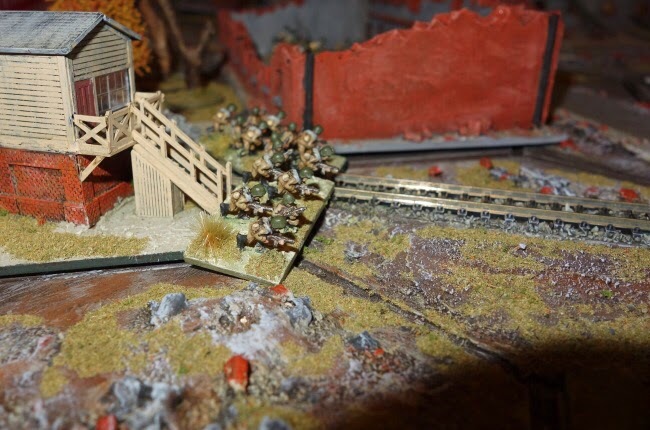 You can see from this picture that even if the boards were kept in the same position, there is plenty of scope for the plonk down terrain to be re-arranged to give new challenge, so given that there is some ability to move the boards around, the set up should provide gaming interest for years to come. 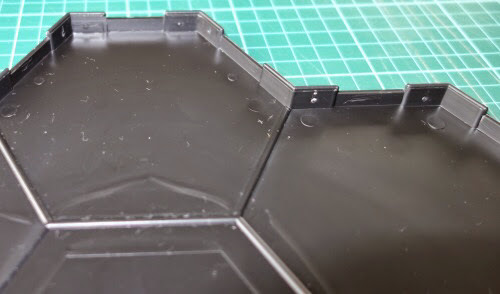 The corner pieces of buildings are very flexible and can make quick fillers for the boards. Since this scene was photographed, I have made another 2 hex building (picture inserted mid way up this post - the building with the fallen gantry inside) and a brick kiln / furnace as show in the previous post, which adds variety or helps increase the density of buildings if needed. I am at the stage now when things can just be added slowly as the fancy takes me. Conclusion - This post is something of a combined effort with the earlier post covering the two Stalingrad scenarios. It was the Pavlov's House and The 37th Guard scenarios that got me wanting to do a city specific landscape. It has therefore been head down for the past few weeks while building the set and play testing those two scenarios, but I am pleased by the results and the effort has been very worthwhile. It all looks very good and perhaps better than the photography portrays - at least to my older eyes :-). If this post encourages you to make a similar board or you have one already that is working for you, please add a comment to this post. It would be good to hear your experiences. At some future point, I will do a city based AAR. I shouldn't be, but I continue to be surprised by just how much good gaming can be squeezed out of a small space. This project has substantially increased the number of gaming situations that I can take 'Tigers at Minsk' into, plus the landscape can cover other periods from World War I to futuristic, something with mechs or walkers and one page of rules might be fun. Left - A SMG armed guard unit charges out from the building under the cover of smoke to assault German positions in the factory. 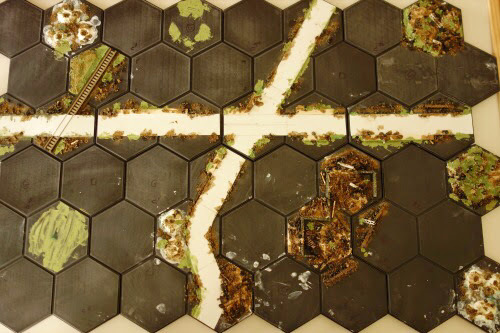 The new terrain tiles can also be used together with my existing grass tiles for low density urban games, perhaps with additional grassed templates being used to block off some of the city hexes to knit the grassed and city hex pieces together. At some point in the future I may do another city tile as a spare to increase the variations that can be made to the board - perhaps giving an alternative to the track board or even adding to it by creating a multi-tracked rail station. Anyway, this has been a long post, thanks for sticking with it. The hexes are from Kallistra. The light flock is a turf from Woodland Scenics. The trees are from K and M with the shattered tree stumps made from fallen twigs collected in May from a local park. That's really stunning, Norm. I certainly wish I had your skill and patience. I'm not sure why, but what amazed me most was the train tracks flush with the road, though the item I wanting most are the set of tanks. Great stuff once again. I found the road over he tracks quite satisfying to do. I was in a model rail shop the other day and was surprised how much was being charged for a set of tanks - so the home made ones are worth doing.